Thanks to all the participants and those who left a comment. I loved reading them. Anyhoo, I had my child pick a number so lucky #7 commenter Laurie is the winner of my prize Highland Sorcerer. Congrats Laurie. I'll be contacting you shortly for mailing details! And as far as the nook or kindle winner, that should be listed soon as well. Good luck y'all for that! I hope one of you that came over here wins it!!! So what are the Holidays like for the Autrey Family? Weird actually. We are still finding our way. Having a child with cystic fibrosis meant that more often than not due to cold season, Chase was in the hospital for Christmas. Fortunately the children's hospital tried to make it really nice for families with lots of special events, even Santa visits, going on. Then there were all the do-gooders that pop up around Christmas. We've met several Texas Rangers, and Dallas Cowboys, and Dallas Cowboy Cheerleaders (tiny petite things in real life-could blow them over with one breath), a few celebrities like Garth Brooks. As nice as that is, we'd much rather be at home. Then we had the year when we nearly made it without a Christmas hospitalization Chase's lungs were holding their own (okay he had just been in over Thanksgiving so our fingers were crossed), but just our luck, my sister-in-law thought it'd be a great thing to hook a trailer behind a SUV and enjoy a pseudo hayride in which our other son fell out and got run over by the trailer. There was a horrifying Bump as the first tire ran over him, then a second Bump as the rear tire got him. Christmas Eve. Miraculously he was fine, not even bruised, but had to take him in just to make sure... 6 hours later totally bored in the ER, we got to take him home. Joy. What would a Christmas be like without that? And now one of our favorite Christmas carols (cuz we are all sarcastic butts) is "Samuel got run over by a trailer". So for years we haven't had a normal Christmas. Two years ago, Chase passed away a couple of months before Christmas. No hospital stay, but being at home sucked too, so we hit the road and went down to Galveston. Yes, Galveston in winter. Cold windy beaches, flopping jellyfish, but great food. We wandered around not really knowing what to say to each other and missing the one we lost terribly and opened presents in a motel room beneath a little tree because we couldn't bear to be at home. Last year? A hotel again, this time closer to home. 15 minutes away actually, which was kind of lame.But we saw a few movies, went out to eat, and went ice skating together so it was fun and different, but home pulled us back a day earlier than we planned. This year it's time to stay home. I still won't hang any stockings. The youngest is insisting on getting our tree out so that's inevitable though we're waiting for our daughter to fly in from college and she and T can decorate together, though I'm not sure where to put the tree since part of my present to my husband this year is letting him keep his music set-up in our living room for all of December. It is wall-to-wall speakers, guitars, cords, amps, drums, and electric piano. Don't ask. I can't fathom why he needs the huge speakers in a little 10x16 room either. He just does. I get two reactions from people coming to our door. One of amused indulgence from the women and salivation from the guys. So there you have it, the not-so-Holidayish-yet-true story of Autrey Christmas Pasts. I have no idea what this one will end up being like. Shrugs. Run along and comment on all these blogs. I hope you win a Kindle. 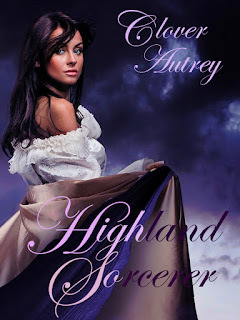 My personal giveaway will be a signed copy of Highland Sorcerer, so be sure to comment and while you're at it, let me what your most unusual Holiday was like. My most unusual holiday was last year because it was warm outside which is kind of wierd for where I live. Thanks for the chance to win! I hope you'll be able to return to a "normal" Christmas (whatever that is) as our grief subsides. Wishing you all the best. Sorry to hear the reason for your unusual holidays. We had a Xmas morning in a hotel room when my children were little because fog descended on our drive from southern to northern CA. Kinda pathetic but the spirit (mine because my husband was asleep) of having some type of celebration was there. My strangest Christmas was also in a hotel room in Jacksonville, NC. My husband was being deployed to the Middle East in Operation Desert Storm. We had a small tree, but couldn't find anyplace open on Christmas day that still had food. All of these Marines and their families with few open restaurants. The day after I left, they received their orders and were shipped out. Glad I wasn't there. That definitely was one strange Christmas. I haven't had any strange Christmases but one of the best I remember was leaving the restaurant after Christmas dinner and seeing hang gliders coming off the mountain. That wouldn't be so unusual if I lived in California, but I like in Colorado! Here's to a Merry Christmas to you and your family. We have had pretty normal Christmas's in our house so far. I haven't really had any unusual holidays. Everything is usually pretty normal for us! Thanks for participating in the hop! I am sorry for your loss and your continual pain. i will pray for your healing this time of year as I do for many others for whom the season brings joy and sorrow. I too belong to the what I call the silent sisterhood of women who have lost children. Thankfully, my holidays have been peaceful these past few years. Wishing your family a happy holiday this year. I guess it would be when my husband and I lived in Macedonia and celebrated christmas there with no tree or decorations, we did have a dinner with friends though and talked to family via skype! My strangest holiday was the first one where I had snow. We moved from Florida to Pennsylvania! Thanks for the blog hop! Happy Holidays!!! Mine was the awful year my kids had the flu. I really enjoy the holiday season. I enjoy the smells, the food and lights. Oh and the music too. Not much into baking anymore. But I do enjoy tasting, ask my scales. Tee Hee. Great blog. Thanks for being part of the Holiday Blog Hop. I guess my first Christmas after I got married. I had never spent Christmas with my husband family and even though I knew his parents and siblings I had never met his uncles and cousins. My nephew but popcorn in the microwave with plastic still on, our house was full of smoke. I am sorry about your dear son..they thought my son had CF when he was small, and I understand about not having a Christmas without a child being sick. Please, try hard to do the special things for your other children..they need it, and I hope that you find peace in your heart this Christmas. Hi y'all. Thanks for stopping by. I'm reading and enjoying every one of your unique Christmases. I'm so sorry for your loss and pain. I had a child taken from me two days before Christmas, 28 years ago. The only traditional part of holidays for us is that we are together. Even if not in person, we have contact with each other. Electrical contractors las vegas nv - When you have a residential, commercial or industrial electrical project that needs to be done quickly and with an eye for quality, look no further than BELDY ELECTRIC.